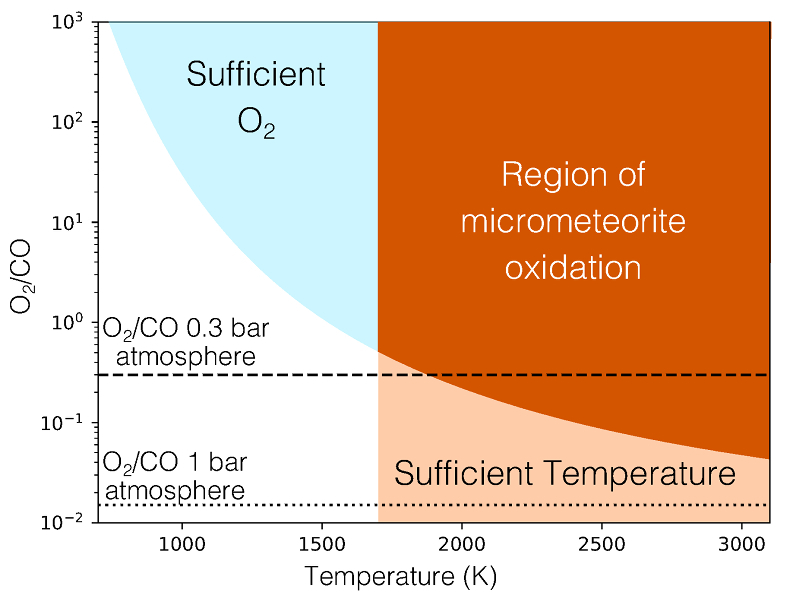 Rimmer, P.B., Shorttle, O., Rugheimer, S. (2019) Oxidised micrometeorites as evidence for low atmospheric pressure on the early Earth. Geochem. Persp. Let. 9, 38–42. 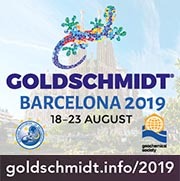 Simons and Kavli Foundation (SCOL awards 599634 for PBR and SCOL awards 339489 for SR), and Trinity College Cambridge for OS. Table 1 Mixing ratios for two model atmospheres. 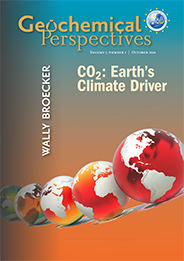 Figure 1 Temperature profile for the Earth’s atmosphere with surface pressure of 0.3 bar composed of 33 % N2, 33 % CO2 and 33 % CO (dashed), and 33 % N2, 66 % CO2 (solid). 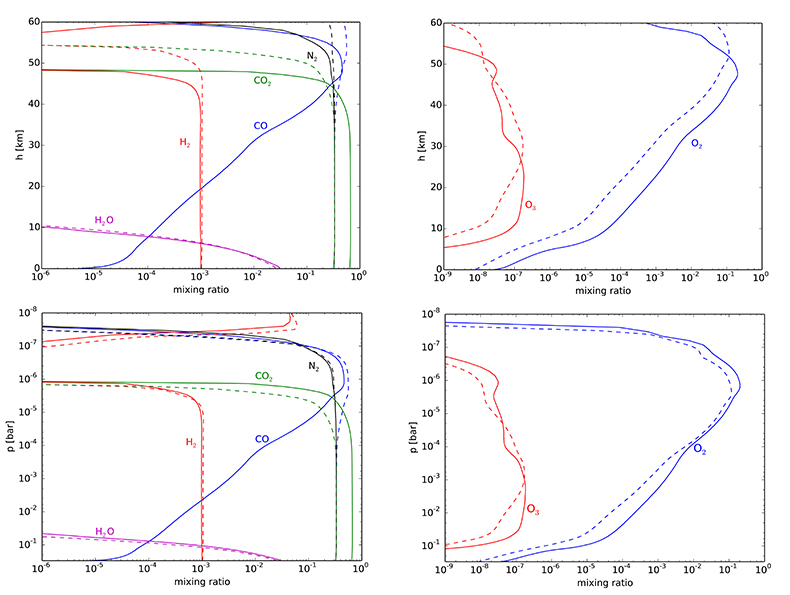 Figure 2 Two low pressure model atmospheres of the 3.5 Ga − 2.7 Ga Earth. One model includes a surface mixing ratio of CO of 0.33 (dashed), and the other a surface mixing ratio of 10-6 (solid). The surface pressure is 0.3 bar for both models. Mixing ratios are shown as a function of atmospheric height, h (km; top two figures) and pressure (bar; bottom two figures). Tomkins, A.G., Bowlt, L., Genge M., Wilson, S.A., Brand, H.E.A., Wykes, J.L. (2016) Ancient micrometeorites suggestive of an oxygen-rich Archaean upper atmosphere. Nature 533, 235–238. 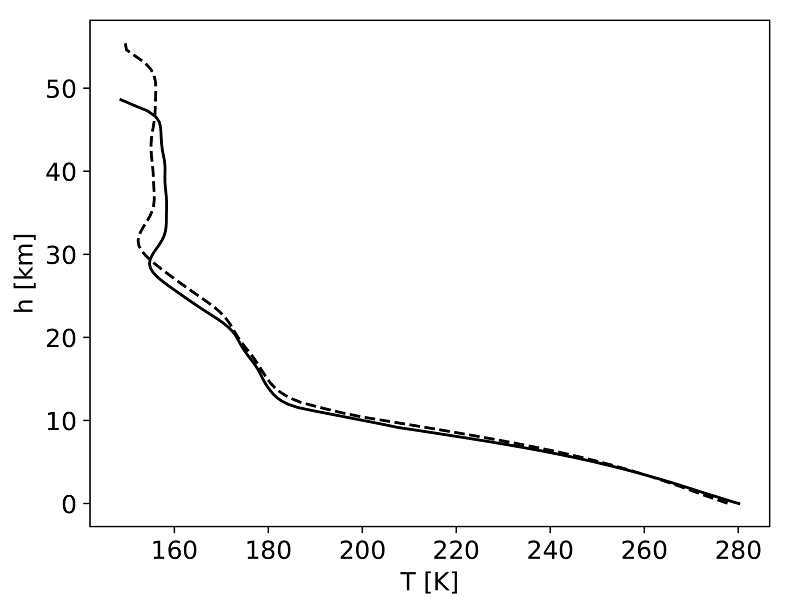 ), as a function of the melting temperature T [K]. Shaded regions show where there is sufficient O2 (light blue), sufficient temperature (light orange), and the overlap between these two regions (dark orange). The dotted line is the O2/CO ratio in the upper atmosphere for an anoxic atmosphere with a 1 bar surface pressure, and the dashed line is the O2/CO ratio in the upper atmosphere for an anoxic atmosphere with a 0.3 bar surface pressure.